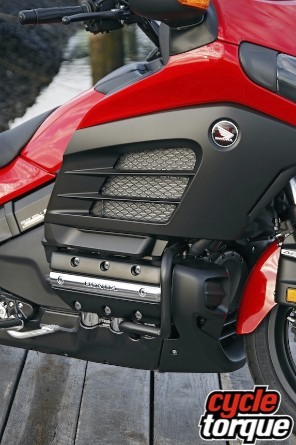 HONDA’S Goldwing is loved by many, but loathed as too big, heavy and cumbersome by others. It has polarised opinions for decades, but with the launch of the F6B – a stripped-down, lighter and more aggressive version – the haters should sit up and take notice. By stripping the Goldwing bare, Honda has shown there’s a very nice looking motorcycle underneath all that fairing, and with that massive flat six engine providing power, it’s a glorious bike to ride in its intended role. My take on the design is that Honda finally felt there was another bike lurking inside the Goldwing, one that would entice some new buyers to the Honda family who wouldn’t normally consider a Goldwing. While we call it a stripped down Goldy, to be fair it’s only partially stripped. 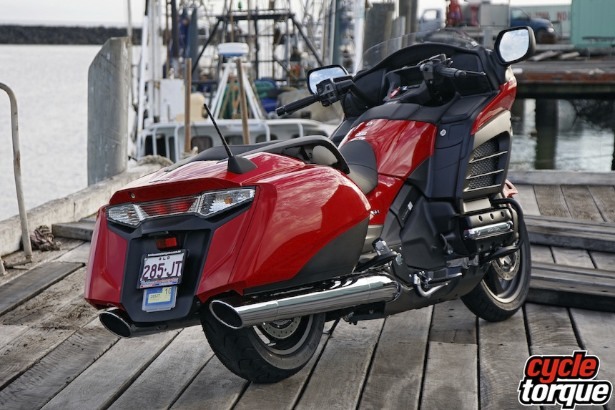 It still has a fairing, but with a shorter screen, and the integrated top box of the Goldwing is gone. Those two things make a huge difference to the overall size and look of the bike. I see it as a fantastic touring bike which will not intimidate some riders like a Goldwing can, and it’s more comfortable and long distance capable than most cruisers out there. The new styling makes the bike look less cumbersome. You can see over the cut-down screen, something many people prefer to looking through a screen. Losing the top box improves the styling and handling, because it’s lowered the already low centre of gravity even more (and your pillion can’t fill that box up with heavy ‘stuff’, either). Integrated panniers hold more than enough luggage. The Goldwing F6B uses the same engine and running gear as the regular top spec Goldwing. 1800cc of flat six (three pistons out each side, sitting just in front of the rider’s feet) grunt will ensure top gear touring is dead easy. It’s simply a sublime engine, torque laden and very flexible. The design has been around for ages, but works really well, and combined with the shaft drive this drive train will last for years and years. It’s housed in an alloy twin spar frame, which Honda adopted for the Goldwing some years back. Honda’s Dual Combined ABS braking system is fitted – applying either brake also activates the other, although the emphasis if balanced – squeeze the handlebar lever hard and you’ll feel the rear brake being applied also, but you’ll feel the front end dive. Apply just the brake pedal and the bike seems to squat as both front and rear brakes are activated. Honda has been innovative in this area for many years and have it worked out I can assure you. Suspension on the whole is non-adjustable, except for the electronically-controlled spring preload on the rear shock, which luckily is easy to navigate and use. It’s great when you add a pillion, you just pump it up to suit. The Goldwing can be a bit intimidating. It’s big, it’s heavy and it knows it. Not so much the F6B. 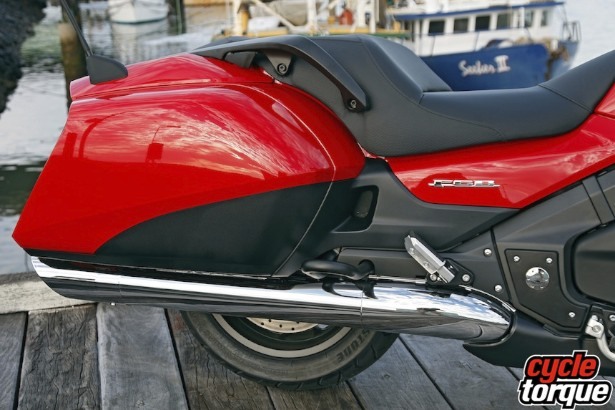 Although the F6B is still a big motorcycle, it doesn’t feel anything like as intimidating as the Goldwing. There’s lots of room for the rider, as you would expect, and the controls are all well placed. I like the styling. I never heard a bad comment about it, and I especially liked the black (Graphite Black) colour scheme. It looks sinister. Other styling points which were easy on the eye are the integrated panniers, lower screen and the dual exhausts which sit under each respective pannier – nice. Even cruising around town the bike is lovely to ride, and the combination of the low centre of gravity and the 725mm seat height make a mockery of the 385kg kerb weight. It just does not feel anything like that heavy a machine. Our test route was mainly highways and good back roads, and the suspension handled it with aplomb. On the odd occasion we encountered bumps the bike soaked them up with ease. Yes the suspension has minimal adjustment but it never felt like it needed any. For a big bike it handles very well indeed. Likewise with the ground clearance, while it’s no sportsbike it doesn’t scrape its guts everywhere either. If I had to guess I’d say 200 km/h would come and go reasonably quickly. Sure this bike isn’t built for that sort of riding but it’s more than capable of it. Because it is so capable Honda has graced it with some decent brakes. Instead of the more common four piston calipers found on many bikes these days, the F6B is fitted with three piston calipers front and rear, with the aforementioned CBS and ABS set up. Priced at $24,990 the Goldwing F6B is priced right at the heart of the touring motorcycle market. 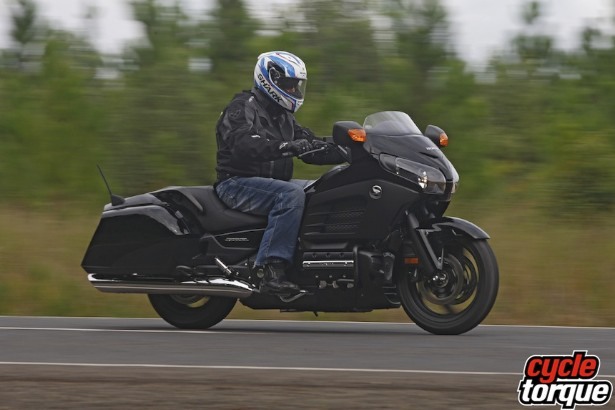 I do think riders who would never have considered a full sized Goldwing will look at the F6B, just like many did when the Honda Valkyrie did over a decade ago. This is one pretty quick interstate transit system.With that massive flat six engine providing power, it’s a glorious bike to ride in its intended role.